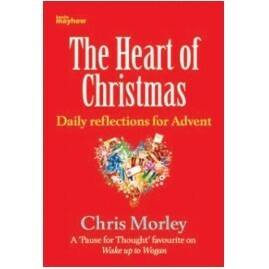 My book, The Heart of Christmas, invites you to use the weeks leading up to Christmas to think about the meaning of the events we’ll celebrate then and how they can help us in our daily living. Each short daily reflection has a light-hearted beginning but a deeper, more challenging ending.There then follow some ideas that you can take a few moments each day thinking about. They come under the headings: rejoice, reflect, remember, resolve. If you follow the links on this site you can find the whole book with each week’s thoughts on a separate page. If you wish to purchase the book, the cheapest place to buy it is on Amazon but if you wish to pay slightly more and purchase via this site, click here. If you prefer to listen to the daily reflections, I’ve put them onto two CDs. To find out more about what’s on the CD or to purchase a copy, click here.